What's the sustainable feature in this photo? No, I'm not referring to the Prius, which gets little use because we bike or walk most everywhere, even in winter. Nor is the red oak the subject of this post, though it shades the pavement and cools the air around our house in the summer. The answer relevant to bicycling, actually, is the asphalt the Prius is standing upon. Not that asphalt is so great; in fact, the world would be better off with much less of it, and I'd rather the car were perched on pervious pavers instead. But there's something in that small patch of pavement, extending far enough towards the house from the sidewalk to fit a parked car, that could contribute in a big way to making Princeton more sustainable in the future. The logic goes like this: Tuesday evening at the town council meeting, organized in opposition to bike lanes along Hamilton Avenue, residents argued with at least temporary success that the loss of their street parking privileges would leave them hugely inconvenienced. There was at the same time a strong expression, including from council members, of the need to make Princeton more bike-friendly. To do that along main routes like Hamilton Ave, street parking will need to be curtailed or banned altogether. Given the strong support for a more bike-friendly town, bike lanes may be seen as inevitable on Hamilton Ave. If it's just a matter of time, then homeowners there should be taking advantage of the imminent street repaving to request additional or wider curb cuts in front of their homes to accommodate short driveway spurs of the sort in the photo. There's another sustainable aspect to these small spurs for off-street parking. To the right of the car in the photo is a driveway that extends down to a garage, blocked by snow for weeks now. Rather than shovel the long driveway, or pay for a snow-blower or plowing service, I took a more back- and pocketbook-friendly approach and left the car parked close to the street as the snowstorm approached, then shoveled only the top portion, which is wide enough to accommodate two cars side by side. Though we have no street parking in front of our house, if a friend or workman stops by, they can park in the extra space next to our car. More off-street parking options also aid the town's plowing of streets, which can be complicated by cars left on the street. It may seem like a minor thing, yet the lack of this sort of off-street parking plays a big role in scuttling progress towards a more bike-friendly town. Seemingly mundane changes like these determine whether high-minded goals like sustainability can be reached. Even in the 21st century, when there is so much to recommend using bikes to get around in a town like Princeton, it's still a makeshift, improvised affair. Bicyclists are frequently caught between a line of parked cars on the right, the door of any one of which could open at any moment, and impatient automobiles trying to pass on the left. The most sustainable form of transportation is still considered fringe, tolerated but not fully welcomed. That's why the proposal to make bike lanes along Hamilton Ave. between Snowden Lane and Harrison Street is significant. It seeks to create a space, no matter how localized, specifically designated for bicyclists. It's common in Princeton for any proposed change to draw opposition. That public input can either lead to a better final result, or it can create long delays for worthy projects. The big point of contention with the bike lanes is that neighbors would no longer be able to park on the south side of Hamilton Ave. I live on Harrison St. just up from Hamilton, so know the territory, having all too thoroughly dog-walked the area. I've also driven up and down that stretch of Hamilton Ave. enough to witness how its ample width promotes speeding. The police department uses that stretch as a speedtrap, teaching memorable lessons while feeding the town's coffers. Since no parking is allowed along North Harrison Street, except for deliveries, I can attest that no on-street parking creates some inconvenience, but we are fortunate to have a driveway that's wide enough in places to allow a car to park without blocking others in the driveway. For parties, guests park on side streets. It's been gratifying to see a growing number of pedestrians and bicyclists along Harrison Street, even though it means an extra level of alertness as we back out onto the street. Because that part of Hamilton Ave. is wide, cars tend to speed. Because so few cars park there, on-street parking does little to calm traffic. How many cars park there on average? The town has done some recon over time, according to Mayor Lempert. The average is two. I've seen nothing during my trips down the street to contradict that assertion. If bike lanes help calm traffic, the lack of a bike lane on the south side will perpetuate the tendency of drivers to speed. However, the lack of on-street parking may mean more car shuffling if the family has more than one car, and will require guests who can't fit in the driveway to park on nearby side streets. It appears that the road width will remain the same. I had heard that the road might be widened, requiring removal of shade trees. This link shows five options, only two of which would widen the street beyond its current 30 feet. It's illuminating, though, to see that the actual right of way is 60 feet wide, meaning that the first fifteen feet of people's front yards is not fully under their control. Right of way widths vary significantly from street to street in Princeton. Two of the four side streets, Stanley Ave. and Leavitt Lane, lack sidewalks, requiring that pedestrians walk out into the street to get around parked cars. Again, the minimal use of Hamilton Ave. for on-street parking means that installing bike lanes would seldom displace more than a couple cars to side streets. To calm traffic, the car lanes need to be narrowed, and bike lanes seem the best means of doing this. A bike lane on the north side of the street, where parking is currently not allowed, seems an obvious means of narrowing the lanes. A bike lane on the south side as well would do more to constrict the lanes and calm traffic than the parked cars currently do. One way of reducing inconvenience for residents who would lose on-street parking would be to allow widening of a portion of each driveway to accommodate two cars side by side. Since bike lanes appear to require nothing more than a coat of paint, the minimal investment could make it easier to try out bikelanes now, then review the decision at a later date. Since the street is currently minimally used for parking, a novel compromise would be to demarcate the bike lane along the south side with a dotted line, meaning that residents are discouraged from parking there, but may if they have no other option. Sharrow symbols could be located in the dotted lines. This would provide some flexibility for residents while also having a calming effect on traffic by narrowing the car lanes. Some precedent for this approach may be found at this link. It's somewhere inbetween a solid lined bike lane and a sharrows. A link to other proposed bike-friendly street modifications in Princeton is here. The Princeton Joint Bike and Pedestrian Committee answers some common questions about the proposed bikelanes here. A Trenton Times article on the neighborhood meeting this past Wednesday, Feb. 18, can be found at this link. It's mostly a series of opinions, informed or not. Actual ordinance being considered is at this link. It doesn't mention that the north side of the street is already a no parking zone. What's missing from this wintry scene on Carnegie Lake, just as a weekend snow began covering the ice? A lacrosse stick, of course, which come to think of it looks like it might work as an emergency snowshoe. During this extended freeze, we'd already skated with hockey sticks, so why not try a bit of lacrosse? Always keeping an eye out for interesting patterns in the ice, I noticed a shape I hadn't seen before. And then another exactly the same. Interesting. Finally figured out that it's the shape a lacrosse ball leaves behind when it hits the ice. 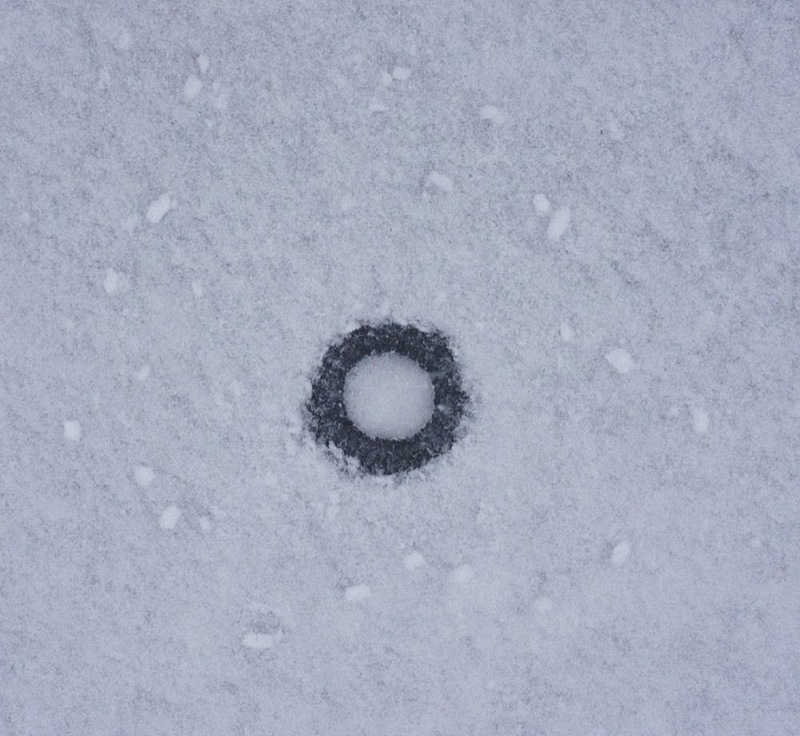 The ball's impact squashes the snow in the middle while blowing a perimeter of snow out some distance from the point of impact, in the shape of white flecks. Looks like a frozen fried egg, sunny side up. The ball kept eluding our sticks, which for someone who didn't grow up playing the sport are just way too small. If we got tired of chasing the ball down as it rolled off across the ice, we could always watch dogs pull their masters up and down the lake. A few skaters, usually solitary middle-aged men, would skate by with their hands held behind their backs. Taking the arms out of the equation makes for a purer feeling of stride, and tilts the torso forward nicely. It reminds me of an earlier era, my father's generation and before, when men might walk with their hands behind their backs. Daniel Day-Lewis does it briefly in the movie "Lincoln". It may seem too modest and self-effacing for our era, because the gesture has otherwise disappeared, surviving only in speed skating, where one hand is held behind the back. A pin oak, with its weepy lower branches extending down and into the ice, made a good seat. On the way back to our boots, by now covered with fresh fallen snow, we felt at one with the snowflakes floating along with us as we glided across the ice. If a camera could paint a scene, it might look like this. Maybe today's winds will have cleared the ice of snow, bringing still more days of winter fantasia. Time out from sustainability for a bit of sports. Jadwin Gym is home to a quiet phenomenon this year. The Princeton women's basketball team is undefeated, standing head and shoulders (at least figuratively) above its competition in the Ivy League and beyond. Is there anyone who can beat Princeton, and thereby spoil a potentially perfect season? Sometimes even a great team can have a bad night. It happened with Princeton last year in the last game of the season, when they lost to Penn. The hard lessons learned in that loss have added to the passion and consistent performances this year. Some quick internet research suggests that this Saturday's game against Yale is the most plausible spoiler. The case runs this way: Each weekend, Princeton plays back to back games, Friday and Saturday. For the past two weekends, Princeton has won by smaller amounts on Saturday. Maybe they played weaker teams, or maybe there's a slight drop in energy the second night. Yale is the most winning team next to Princeton in the Ivy League, and they have a home game against Princeton this Saturday. The potential threat of Yale seems diminished after their winning streak was broken by Harvard last week, but there can also be a rebound in intensity after a loss. If you plan on going to one of the home games, and happen to mix an interest in sports and sustainability, check out these two past "sportscasts" on the trials and tribulations of improving recycling at Jadwin Gym. Sunday's postgame update: A squeaker it was. I hadn't expected to be that right. The pattern of lesser winning margins on Saturdays continues. Princeton won by six, the first time in 18 games that they didn't win by double digits. But a win's a win. Now, if we could just start talking stats in sustainability like we talk about them in sports, we might make more progress winning today for a winning tomorrow. I'm posting a couple events today and next Wednesday, sent to me by a friend. The article about Sam Daley-Harris' efforts to reconnect people to government is relevant beyond working for action on climate change, because it focuses on developing relationships across ideological divides. The Citizens' Climate Lobby (CCL) is using this approach. The Princeton chapter meets the first Saturday of each month. Our February meeting of Princeton's Citizens' Climate Lobby chapter is this Saturday, 12:30-2:30, at 28 Laurel Road, Princeton. For more info about these monthly meetings, which feature a different speaker each month, call Callie at 609-240-2425.